When is the best time of day to cut your grass? People ask me all the time, "when is the best time of day to mow the lawn?" So I wrote a blog post that outlines the best times of day and the worst times. To date its our most shared and read article we have written for ur blog. So I decided that the the question needed some more attention. I created this handy illustration that shows you the pros and cons of mowing the lawn during the early morning, late morning, mid day, afternoon, and early evening. 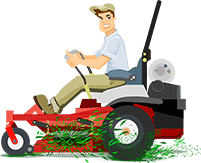 You can mow the lawn any time of the day, but there is an optimal time to cut it.